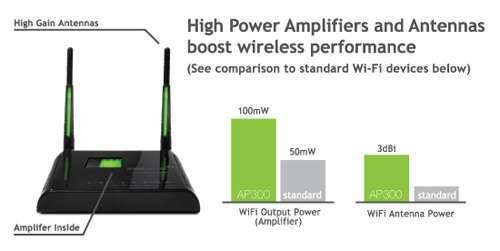 The Amped Wireless AP300 High Power Wireless-N Smart Access Point adds long range, high speed wireless access for existing wired networks or networks with older wireless technology. With the latest 802.11n 300Mbps MIMO technology, high power amplifiers and high gain antennas, the Amped Wireless AP300 High Power Wireless-N Smart Access Point provides up to 5,000 sq ft of wireless coverage. The Smart Access Point features 4 wired ports for connecting additional wired computers, printers and other network devices. With Smart Security features, creating a safe and reliable wireless network environment has never been easier. True Plug and Play set up, makes setup as simple as connecting the Amped Wireless AP300 High Power Wireless-N Smart Access Point to your router's network port. No software or additional setup needed. Install anywhere with the convenience of Power over Ethernet. No setup required. Connects to your home router with true plug and play. Add long range wireless access to your home or office's existing wired network. The High Power Amplifier and Antennas provide the power to add up to 5,000 sq. ft. of amplified wireless coverage. Need more networking ports? 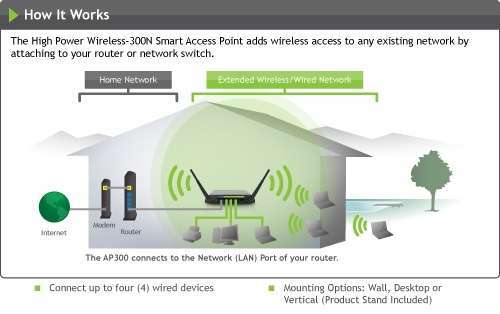 The Smart Access Points provides up to 4 10/100Mbps wired ports for connecting additional wired computers, printers and other networking devices. You're in control! Smart security features allow you to restrict access to specific users, set a daily time schedule for when the wireless network is available and when it is not and control how far your wireless network coverage reaches through wireless output power adjustments. The Smart Access Point also supports secure push button setup for WPS enabled devices. Use Power over Ethernet cables to install additional Smart Access Points in locations without easy access to power outlets. Great for installations with multiple Access Points in hard to reach areas. The Smart Access Point connects to an available network port on your router and automatically configures itself to your network. There's no additional setup or software necessary. Wireless-300N MIMO technology provides the speeds and bandwidth necessary to stream video, audio and large files easily. The AP300 is great for high traffic networks.